Ask anyone who has ever had a puppy and they will surely tell you that one of a puppy’s favorite activities is mischievously snooping around the house and finding items to “steal,” such as socks, paper towels, Barbies and more. In fact, this is apparently so fun to dogs that without proper training, even many adult dogs continue to do it. But the fun doesn’t stop there. Often, it develops into a game of “catch me if you can,” in which the humans run around trying to get the item while the puppy runs around outsmarting them. Dining room tables are often a favorite tool in the canine sleuth’s caper, as they cut through under the chairs, making their humans literally run in circles after them. So, what’s a human to do? You can’t simply let the dog chew up the item… to do so would be dangerous for your dog, damaging to your items and certainly not conducive to teaching the dog not to do that anymore. In desperation, many people resort to the dog treat, used to lure the dog into dropping the item in favor of the snack. However this serves as a reward for stealing stuff and dogs quickly figure out that whenever they want an extra snack, they can simply steal something to end up getting one. 1. Puppy proof- Tidy up so there’s less for your pet to steal. 2. Move slowly- If you chase your dog, you’re in the game. Instead, walk calmly and use assertive body language. 3. Do obedience- Basic commands, such as “sit,” “down” and “stay” can go a long way to earn your dog’s respect. 4. Tell him “no”- Don’t forget to use this phrase consistently, instead of saying “Stop it,” “Get over here,” etc. 5. Provide toys- In a variety of different textures. If he gets bored with them, rotate them once in a while by keeping some available and some in a cabinet to switch up. 6. Make sure the toys are available- If the toys are in the living room but your dog is gated into the kitchen, it’s no wonder he’s stealing the kitchen towel. Bring them into whatever room your pet is spending time in. 8. Set him up- Actually practice not stealing stuff. 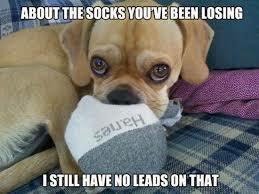 With your dog on leash, lay out a bunch of items such as socks, remote controls, etc. When your dog looks like he’s planning on snatching something, say “No, leave it!” with a tug of the leash. If he doesn’t take it, praise lavishly. If he does, use the “No,” replace with a dog toy, then praise. 9. Teach self-discipline- Practice obedience commands, particularly the “down/stay” with the items in easy reach. Praise your dog for coexisting with them but not taking them. 10. Do not give “people items”- Such as old slippers, children’s stuffed animals, etc. To your dog, they smell like “the humans’ stuff,” and it is almost impossible for them to understand that it’s okay to play with the old slippers but not the new. 11. Exercise- A tired dog is a good dog. Be sure to give your pet plenty of exercise: physically, through walks and playing, and mentally through obedience training. This will help reduce the urge to create his own activities due to boredom. 12. Maintain a sense of humor- After all, a puppy is a puppy and their antics can either make you laugh or drive you insane. Try to keep perspective, do what you have to do to work on it and don’t forget to enjoy your dog along the way!